Happy August 1st! Before I share today’s top ten I have to share that today is my husband and I’s 3 year anniversary! I am so excited for a mid-week date night to celebrate 3 years of marriage with my best friend. Check out our engagement story and winter engagement session and our whimsy UP engagement shoot and then our wedding posts which are in 3 installments … getting ready // first look and bridal party //ceremony. Thanks for taking a walk down memory lane with us! 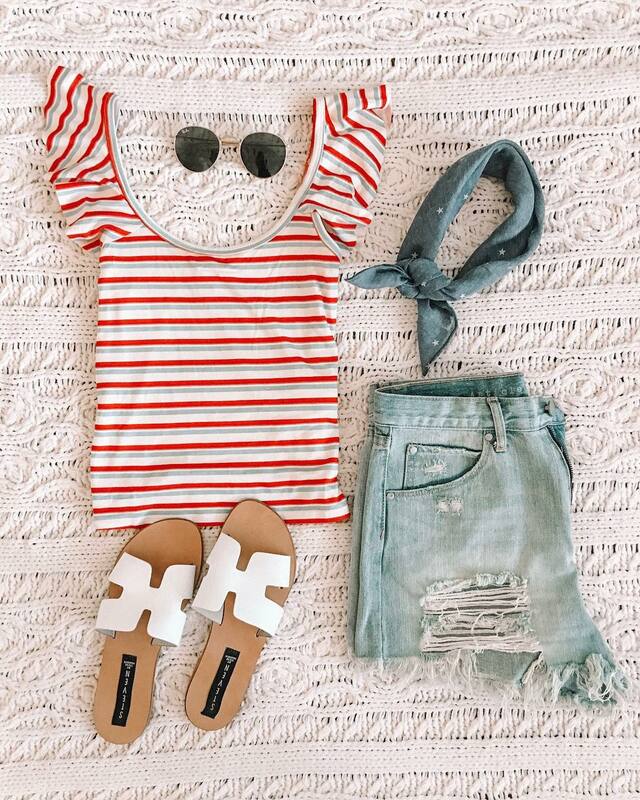 This month’s top ten involves lots of summer stripes and some Nordstrom Anniversary Sale finds! This dress has become one of my go-to’s this summer! It’s so easy to wear, comfortable and the knot detail adds a fun touch! Nothing like a t-shirt dress for easy, effortless summer style! This dress is so flattering and one of my favorite Nordstrom Anniversary Sale finds! This cutie can be dressed up or down for work or date night! The best part? It’s just $30! See how I styled it here. I love a good pair of distressed denim cutoffs and was excited to discover these. They do run a bit small…I ended up ordering 1 size up, and even read reviews of others ordering 2 sizes up, so know this before shopping! But for $50, you can’t beat these! A great light-wash and just the right amount of distressing makes these your new fave summer shorts! Hands down my favorite t-shirt! I was so excited to see that it was part of the sale. I actually owned this in a few colors before the sale and ended up picking it up in 3 more colors during the nsale. For one, it’s on sale for $12 and 2, it’s the PERFECT tee! I love how this one washes, the slightly oversized fit and how easy it layers! This cardigan is such a steal! I will be wearing this cozy piece all fall and winter long! If you’ve been thinking about splurging on a Barefoot Dreams cardigan, this is a great dupe and alternative!! This one has been going in and out of stock and I’m hoping for a full re-stock after the sale. This is a sweater that’s worth full price! I love love LOVE this sweater! The color combo is absolute perfection. I can’t even imagine a more fun or perfect mix of colors! The one thing to note about this sweater is that it’s on the shorter size. I’m wearing a US 4 and it fits perfectly, but if I re-ordered, I might have sized up for a more oversized fit! One of my favorite pairs of mules is on sale and comes in 3 gorgeous colors! I got these this spring and love the unique detail of the studs! They also come in black leather and a gorgeous burgundy suede that is perfect for fall! These are the COMFIEST mules I own!! This top was a top seller right around the end of June, beginning of July and it’s no wonder why! It was the perfect top for the 4th of July! This fun summer top fits like a body suit, but without the actual annoying body suit aspect because let’s be real…body suits are SO unrealistic…especially when you have to go to the bathroom! This is a great layering basic. It’s so soft and comfortable too! Pair it with a cardigan or jacket and easily dress it up or down! It’s currently available in 4 colors and just $20! Size up to be able to knot the front! This sweet summertime sweater was top seller for the month of July by FAR. But it’s no wonder why…pastel stripes? Yes please! The great thing about this cutie is it is perfectly oversized, meaning you can wear it over leggings, as a dress, or tuck it in with denim shorts! All such great looks! I am loving your Fourth of July look! your studded mules are the cutest!